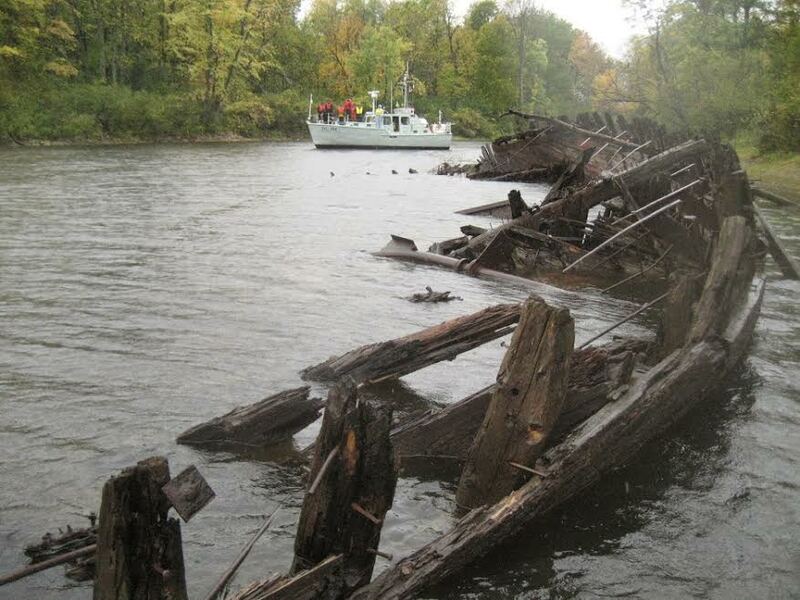 In the 80's, the diver's society in Ottawa did a lot of research and found 12 shipwrecks in the immediate area, from Kettle Island to the Ottawa Locks, the majority of which are steamships from the late 1800's. When we expressed interest in this, in 2014, the then founder and president of the society sent us a great deal of archived information including the charts and books and photos of all of the shipwrecks in the broader region. We were very lucky to receive this because the society ceased to exist some time ago. In 2014, the Hydrographic Service of Canada did a sounding of the region in order to update the information on the charts, and found yet more shipwrecks, two beside Upper Duck Island. The most recently shipwrecked boat and the only one which is visible above the water is the Jean Richard, seen in our photo on this page. It's first life was as a wood transport boat on the St. Laurence river in the area around Quebec City. The first owner was Mr. Richard and his son was Jean. We have a one hour long NFB video on the step-by-step construction of this boat. This film was made because it was the last "goélette" a Quebec boat specially made for finding and transporting logs which had been lost by larger companies during their transportation by river and bringing them to paper mills.The boat was launched in 1959. Once logging on the water became forbidden (so that the waterways could be used by the public), boats such as this no longer had a purpose. So, the Jean Richard was purchased by an organizer of performing arts events as a floating theatre, and changed the name to Ville de Vanier. However, this idea was not financially viable and so a few years later the boat was sold to another orgnaizer in Gatineau as a floating film theatre at the Hull Warf. The boat was there for a few years but was also not a financial success. During the winter, it was stored in a bay opposite the Rideau Falls, and three weeks into it's storage, it was distroyed by fire. Each of the 14 shipwrecks in the area have a history as interesting as this. This is the kind of history which we would very much like to present in our future interpretation centre.